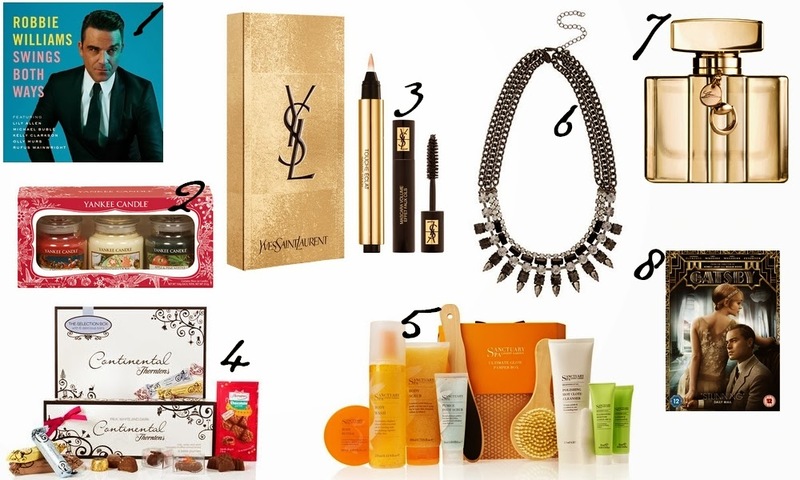 Christmas Gift Guide #1 – For HER! Hello everyone! Here I have compiled a Gift Guide for the women in your life. This could be anyone, your Mother, your Auntie, Nan, Sister, Girlfriend, whoever! I have based the gift guide below on my own Mother. Any album that they would love. You can never go wrong if you know they like the music on there! You could buy them an artist they like’s album, or even a soundtrack to their favourite film! Also, if you’re on a budget and not buying a new album, they’re likely to be £5 and under. This contains the fragrances Christmas Eve, Christmas Cookie and Apple & Pine Needle. I don’t know many women that don’t love candles, so I believe this is a present you can’t go wrong with! The Christmas scents for Yankee Candle smell gorgeous too. This contains the famous Touche Éclat and a mini Mascara Effet Faux Cils. More for the make-up fans in your life! I think this is a perfect gift set, and it is so classic and elegant. This contains a Continental Selection Box, the Continental Milk, White and Dark Collection, Caramel Parcels Bag, Christmas Robin Alpine Log and Christmas Pudding Truffle. Who doesn’t love chocolate?! I don’t know anyone who doesn’t love getting a bit of chocolate for Christmas, I think you can’t go wrong with this bundle! This contains a Pumice Foot Scrub, a Spa Pedicure Foot File, Hot Cloth Cleanser, Spa Facial Muslin Cloth, Radiance Exfoliator, Illuminating Moisture Lotion SPF15, Body Wash, Body Scrub, Body Butter and a Spa Skin Luxury Body Brush. I think Sanctuary is a luxury (but not super expensive) brand, and everyone loves a pamper every so often! I think this is a lovely necklace, and would go perfectly with most outfits! (Also like I said, I based this around my own Mother and she LOVES statement necklaces). You can buy this in sizes 30ml, 50ml and 75ml, you can also buy a gift set containing a 50ml EDP, Mirror and a 50ml Body Lotion. This smells gorgeous, it’s heart notes are White Flowers and Musk (I can never smell the musk though), the Top notes are Bergamot and Orange Blossom and the Base Notes are Leather and Wood. Now this is where you can make something meaningful! You could buy them their favourite film (if they don’t already have it on VHS, DVD, Blu-ray and UV) or a film you’ve seen together at the cinema. I think that DVD’s are quite nice to get as when it’s a snowy/rainy day you can just snuggle up under a blanket and pop a film on.